The Danby DDR6009REE is very similar to the 70 Pint DDR7009REE. Like all Danby dehumidifiers it complies with Energy Star® requirements and is an energy efficient unit. While less powerful than the 70 pint model the DDR6009REE will give good service in medium to large areas to control basement humidity. In numerous user reviews the Danby DDR6009REE is highly rated by the majority and is clearly one of the best models in its class. Many people buy this unit for use in a wet basement and are delighted with the speed with which it reduces moisture levels and stops the growth of mold. A dry basement helps to reduce house humidity as a whole and the elimination of mold lowers the dust mite population, as the action of mold in breaking down complex structures provides nutrients for these allergen producing bugs. The most consistent complaint about the Danby DDR6009REE concerns the noise level it produces while operating, particularly at the higher of its two fan speeds. It is not one of the quietest models in its class but it benefits from good build-quality and is as well featured as any comparable portable unit. If the noise level is not an issue for you this is a model we would be pleased to recommend for use in a basement or anywhere else in the home. Fitted with castors and two side handles the Danby DDR6009REE is portable and a few ounces lighter than the DDR7009REE. Once again the compact dimensions and conveniently placed side handles make moving this unit as easy as it can be with any high capacity model. The Danby DDR6009REE is equipped with an adjustable humidistat with which the desired level of relative humidity (RH) may be set. This is an energy saving feature since the machine stops running once RH reaches your preferred level. It also makes life more comfortable for you, since an excessively dry atmosphere can be as unpleasant as a very humid one, and protects your possessions, especially wood and leather, from over-drying. Controlling humidity also allows you to run your air conditioner to a slightly (2/3°) higher level since less humid air feels cooler, providing an off-set saving in energy costs. When the humidistat detects that the programmed level of relative humidity has been achieved it will switch off the compressor but the fan will continue to run. This is common in portable dehumidifiers and allows the humidistat to test the air for the most accurate reading. If relative humidity rises once more the compressor will restart to resume the moisture removing process. The Danby DDR6009RE also has an auto-defrost function. People are often surprised to discover that ice can form in the machine even when the temperature is as high as 65°F. This is because the appliance operates by condensing water from the air on "refrigeration coils", just like those in your refrigerator. The auto-defrost delays the formation of ice on the coils until a much lower temperature is reached, in this case 41°F. Auto-defrost detects the build up of ice and stops the compressor. The fan continues to draw air across the coils and the ice is melted by the heat in the air. The cooler the air the slower the ice melts so as temperature falls to the mid 50's the appliance may be spending more time defrosting than removing water. For this reason a portable model such as the DDR6009RE is not suitable for use in areas where the temperature remains below 60°F for significant periods of the year. Additional features of the Danby DDR6009RE include auto-restart (following a power outage), a continuous drainage facility, electronic keypad controls and remote control, two fan speeds and a 24 hour timer. Just about now you may be wondering, especially if you have already read about the Danby 70 Pint model, which of these two sizes is right for me? Here are some thoughts for you. If you are confident that the area you wish to keep dry is comfortably within the capacity of a 60 pint machine the Danby DDR6009RE is probably the best choice for you. If the space is large enough to cause doubt in your mind choose the 70 Pint model. If you are not sure there are some points that may help you make up your mind. While it is operating a 70 pint machine uses more electricity but a larger machine will not need to operate for as many hours as a smaller one to do the same job. The purchase cost of a more powerful machine will be higher, by up to $50 in this case. A more powerful unit, more powerful than the room really needs, can operate for longer at the lower of its two fan speeds. This makes it run more quietly and it will use a little less electricity than when on its higher setting. The decision is, of course, yours to make but we hope these thoughts help. User reviews consistently praise the DDR6009REE for its effectiveness in controlling basement and house humidity, preventing mold growth and controlling condensation. Some consumers dislike the fact that the fan runs continuously. The reasons for this are explained earlier on this page. Some users have found the humidistat to be less accurate than they expected. Customers find the bucket easy to use but a little flimsy. The continuous drainage facility works well for those who have chosen to use it. Complaints about noise level are common. Few problems were reported about the reliability/longevity of the DDR6009REE. The Danby DDR6009REE is undoubtedly one of the best dehumidifiers available whether it is used in a basement or to control house humidity generally. There is no doubt that the level of noise produced by these appliances is intrusive and this unit is no exception. There are quieter models and it is a matter for your personal judgement whether the other excellent qualities of this unit outweigh this disadvantage. 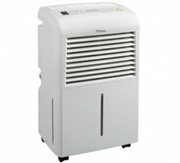 Noise level aside we recommend the Danby DDR6009REE Dehumidifier as a sound investment and excellent value for money.